Finally! Cold weather has descended upon the Southwest. I’ve been digging out all my cozy clothes that were folded away last spring, and have decided that it’s time to refresh my outerwear! I have only one go-to coat, a jean jacket and mostly wear pull-overs and scarves when leaving the house when it’s chilly. I think it’s about time to add a few more to the mix so that I’m covered for any occasion and outfit. After doing some browsing online, I’m absolutely loving these styles I’ve collected for you below. There’s something for any budget, style and occasion. 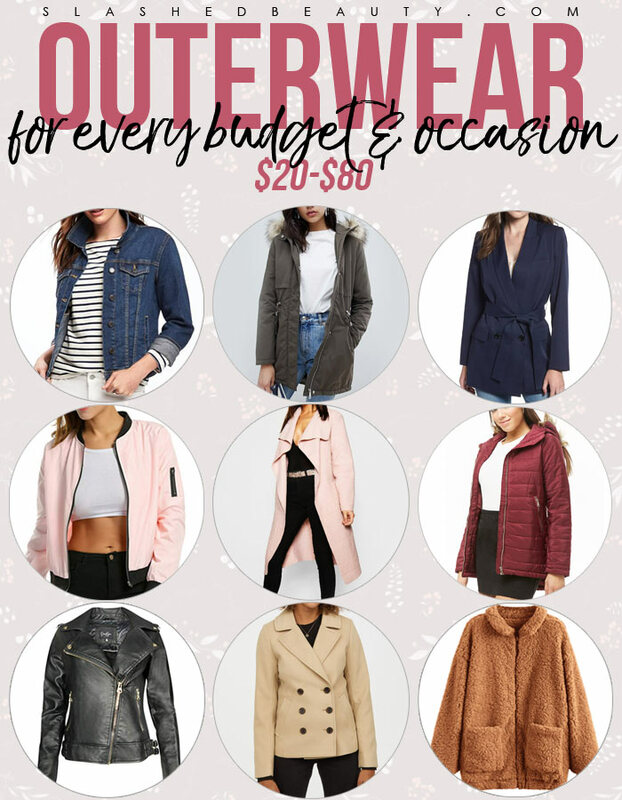 These coats range from $20 to $80, casual to formal. Click the picture of the jacket to find it online. A jean jacket is a must in any closet. It’s an awesome casual staple that layers really well on top of anything from t-shirts to turtlenecks. I love wearing mine with black leggings and boots. If you need a casual coat for colder weather, this parka coat is perfect. It has padded lining and a faux fur trim hood. The drawstring waist lets you cinch the silhouette to show some shape. For something a little more business casual, this belted blazer is great for work or if you just prefer are more structured look. I love the look of bomber jackets— they have sort of a “boyfriend” vibe to them. For a night out or formal occasion, a longer coat will do. This waterfall coat gives the perfect draped look, though it can be belted closed if the wind picks up. If you’re dealing with cold temps and perhaps an active schedule, a puffer jacket is the default choice. This affordable zip-up puffer has a medium weight quilted body and a removable faux-fur hood. It also has zip front pockets to secure any belongings. A leather jacket is a super versatile piece that can be dressed up or down. It’s great with jeans and a t-shirt or an edgy date night outfit. When I think “winter coat” a pea coat immediately comes to mind. This classic coat is double breasted in a felted material that’s slightly fitted. These types of teddy coats are getting super popular lately— they’re super poofy, cozy and roomy. It’s an oversized look, and it’s like wearing a blanket everywhere! What is your favorite style of winter outerwear?